We got some exciting stuff for you today! This story caught my attention a couple of days ago and I feel it is my duty to inform the public. 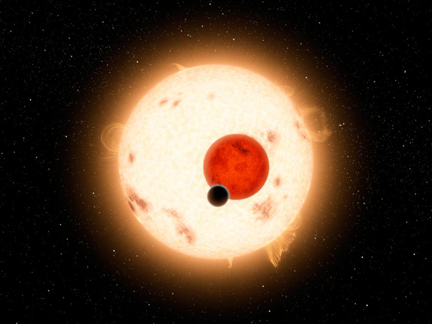 The Kepler telescope, a telescope designed for searching for extra-solar planets, has discovered a planet orbiting two suns. The planet is thought to be an uninhabited gas giant. Scientists are hailing this as a breakthrough discovery since it is the first planet found to orbit a binary star system. Though I think they’re missing something even more important… some have suggested, and I think rightfully, that this planet is probably the famous planet from the Star Wars universe, Tatooine. You remember, Luke Skywalker’s home? The one with all the desert and the two suns? Yeah, you remember. Think about it, many of you know that the whole Star Wars saga takes place “a long time ago, in a galaxy far, far away”. right? Okay. Most of you also know that when we observe a far away object from earth, we are observing the object as it appeared in the past, depending on how many light years it is away from us. So why shouldn’t it be Tatooine? It fits the bill! Well, I’ve done my own calculations, and I’m pretty sure that we can pinpoint, based on the distance of the system, and the exact time I have figured to be “a long, long time ago” to be, that we are looking at the Tatooine shortly after the events of Return of the Jedi. Don’t question my calculations! Anyway, pretty cool, right? However, this discovery is also quite troubling. Since Tatooine appears like it is no longer inhabitable, I think we can safely say that Tatooine has been assaulted by some sort of incredibly destructive force not yet known even by the great sage George Lucas. Something maybe even more powerful than Darth Vader… but not the Death Star…the Death Star would destroy the planet, right? Anyway, since we have been dependent on the famous historian Lucas for all information on that part of the universe so far, and there has been no word from his camp on this matter, it may just go to show that perhaps he just doesn’t know. Maybe there are no records from this galaxy after Return of the Jedi. Maybe whatever happened to Tatooine has affected the whole Star Wars universe. Maybe there is nothing left. I urge NASA to refocus the Kepler telescope on this area and see if we can discover more planets from the Star Wars universe. We must find out the fate of our friends. If not to help them, but to at least make another movie.